Lock in a great price for Amari Vogue Krabi – rated 8.5 by recent guests! The property is a very quiet clean beautiful resort with a white sand beautiful private beach. The pools and landscaping are beautiful overlooking the sea and rock formations. The view is amazing. The staff were great and very helpful. We stayed two extra days because we loved it so much and didn’t want to move on. Gorgeous hotel and property. Pristine beach and pools. Extremely clean and the entire resort smelled like jasmine. The breakfast was out of this world-one of the best I've ever had! The staff and manager were very accommodating and friendly. Overall we thought the Amari Vogue was great and we would definitely return. The hotel itself was very well landscaped, had everything we needed (including good restaurant and beach bar) and had a lovely charm. We loved our room which was very spacious and had great views of the sea and nearby islands. However what made our stay were the staff. They were all extremely welcoming, helpful and courteous. Particular mention to the housekeeping staff who always seemed to go the extra mile. The hotel is nicely located on an idyllic beach and we were able to take advantage of nearby beach bars and a trip to Hong Island on a long boat (which we would highly recommend). Close to beach..I could swim every day. Neat hotel. Nice Spy. When we arrived we learned that our room was on the side of the hotel bordering a construction zone. We asked to move rooms and the hotel staff were helpful and moved our room. We thought they thought it was a downgrade because we went from having a balcony to being on the first floor with a "garden view." We couldn't really see the ocean from our first room anyway (because of trees) and the jacuzzi was larger so we thought it was an upgrade even though it was technically a lateral move. The room was nice and clean and the whole property was beautiful! We were surprised at how calm the pool scene was and how easy it was to get a pool chair since there weren't many compared to the number of rooms. The food and drink prices are a bit high compared to other Thai resorts we stayed at but not compared to U.S. resorts so we didn't mind too much. Overall, it was a beautiful and relaxing stay! Property grounds are absolutely stunning. You can get a clear eye view of the sunset every day. Staff very polite and accommodating. Tuna tartare so yummy too !! Narrow property nestled into the side of the hill beautifully landscaped all the way down to the beach with tiered fountains and pools. Sound of fountains and gentle piped music very relaxing and drowned out some of the other sounds (see negatives) Stayed in the one bedroom villa: very comfortable, lovely linens, beautiful space with high ceilings and Thai decor. LOVED the private plunge pool and privacy provided by the hedge. Bellini’s restaurant served outstanding food by the beach. Happy Hour at Sunset Bar to watch spectacular sunsets a bonus. Beach is tidal: at low tide, quite a long way to water’s edge (also means water is very shallow for a long stretch). Outstanding water to float in, warm and buoyant, gently salty. Beautiful property! It’s a bit out of the way but the bonus is the empty beaches! So overwhelmed by the beauty of the facilities. They said the hotel was full but we rarely saw or heard people. The staff was very friendly. Wana was the best. This is a very romantic spot and mostly filled with couples celebrating honeymoons so things are pretty quiet. There is nothing around the hotel except other hotels. No bars, etc. Long boats come right to the beach to take you out to visit the islands. Not great for families or young kids, lots of stairs as the hotel is built on a slope. I enjoyed the stair climbing to our room but some folks may not. This is now our hidden gem in Krabi to enjoy the lovely Thai beaches and warm water. We will be back! Amari Vogue Krabi This rating is a reflection of how the property compares to the industry standard when it comes to price, facilities and services available. It's based on a self-evaluation by the property. Use this rating to help choose your stay! Beautiful rooms are fitted with polished wooden flooring, traditional Northern Thai artwork and carvings, as well as free internet. Luxuriously furnished, each room has a satellite TV, DVD player and mini-bar. 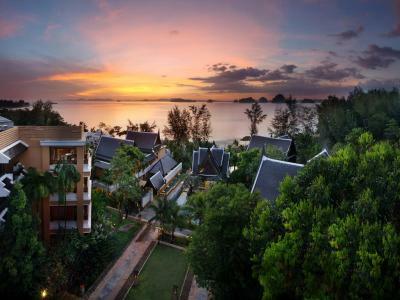 Amari Vogue Krabi is a 20-minute drive from Aonang Beach and a 30-minute drive from Krabi Town. Krabi Airport is about 40 minutes' away by car. Guests can enjoy total relaxation at Breeze Spa with private steam rooms, massages and beauty treatments. Wellness facilities include a fitness room and spa baths. International cuisine is served at the Lotus Restaurant. The beachfront Bellini Restaurant offers Italian cuisine and fresh seafood. Drinks and snacks are available at the Sunset Lounge. When would you like to stay at Amari Vogue Krabi? Lanna-style room features a private balcony with views of the grounds. Spacious room features a spa bathtub and private balcony with views of the sea or pool. This villa features a flat-screen TV, bathrobe and DVD player. House Rules Amari Vogue Krabi takes special requests – add in the next step! Amari Vogue Krabi accepts these cards and reserves the right to temporarily hold an amount prior to arrival. Please note that the property will be closed for renovation from 1 May 2019 - 31 Oct 2019. Please note that the scheduled shuttle service to Aonang is available at 11:00 and 14:30 hrs. The shuttle will pick up guests from Aonang at 15:00 and 17:30 hrs. Guests are required to make an advance reservation at the reception and charges apply. Please note that the rates of the Christmas Eve and New Year Eve Gala Dinner are based on room type and occupancy (guests sleeping in extra beds will be charged separately). Please contact the property for more details. Stunning beach location. Beautifully laid out pools. Excellent service. not that i didn't like .. its a very quiet location so getting anywhere you needs taxi or tuk.. it is quite expensive so be aware.. also the restaurants are quite pricey to . We highly recommend this hotel. After a lot research, we settled on the Amari Vogue and were not disappointed. We were staying 5 nights, so were very happy when they upgraded us on check-in to a bungalow right beside the pool. The room was outstanding and very clean, with a very comfortable bed. The configuration of the pool is excellent, allowing for amazing views and an incredible sunset experience. Restaurants were nice and the Italian food very authentic as well as the Thai restaurant. Two happy hours (sunset and late) were most welcome. Beach was very nice compared to the surrounding beaches. And the entire hotel feels very secluded at the end of a dead-end road. Some reviews have mentioned the construction next door, which proceeds very slowly, but we had no issue with it at all and were right next to the site. Would definitely return. There was construction next to the property that was loud near our room. However, the manager and staff went above and beyond to accommodate us. There are a lot of steps to get to the beach, I counted 118 and this was using the elevator too. Definitely not suited for people with physical disabilities. There are quite a few steps to get to all areas including the restaurants, pools and reception area. The beach restaurant served Italian food (delicious) but I would have liked the option of Thai Tapas too. Staff was very attentive and the location very suggestive. In occasion of our honeymoon we were upgraded for free to a beautiful room with jacuzzi on a large balcony overlooking the sea. They also prepared a cake and sweets to welcome us! Beautiful setting and great breakfast. All the facilities smell nicely and fresh. I would like to thank the staff for making our stay so special! Food was not good (shrimp dry and too much garlic), filet super chewy. Dark room (no day light). Shuttle to main beach was not for free (important as beach in front of property was low-tide the entire day) during stay. Only negative is that it’s a little far from railay beach and Ao Nang. Laundry service was the mosybexpensive service and additiona to that they lost our laundry. The beach is fantastic. The pool is superb. The food is delicious. However, choose this property only when you want to stay away from the crowd and relax. We though it was a shame to have an italian restaurant on the beach and to have the thai restaurant in a building without a sea view. We did not come to Thailand to eat italian food. We were glad to find other restaurants at the end of the beach where we ate delicious and affordable thai food. Except from that, everything was perfect. First of all, the location is perfect. It is located on a very peaceful and beautiful beach, shared by a few other hotels. You can find delicious restaurants in the beach as well. Ao Nang is not far away (only 15 minutes by car). We were very happy to escape the mass tourism and the agitation of Nao Nang whenever we went back to the hotel. Some long tail boats wait for you every morning on the beach (right in front of the hotel) to offer you some excursions. It will be more expensive than going to Ao Nang to take the boat but you save some time and have a private tour. The hotel is quite small which allows you to really relax. 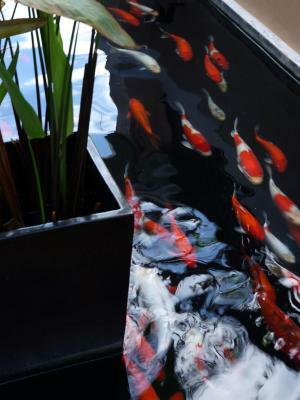 It gives you the feeling of an oasis with the fountains, the pools and the vegetation. The view form the hotel is amazing with all those islets (Hong Islands) and the sunset is breathtaking. The rooms are big and comfortable. The bed is huge, aircon and wifi works perfectly. The breakfast is complete and offers you a wide choice of food (western and asian style). The beach bars offers delicious cocktails. We (almost) tried them all to (really) confirm it was good (and it was) :) The staff is really reactive and helpfull. Smiling and caring. You can rent kayak form the hotel which was a nice experience. All in all, we had an amazing stay. We needed some calm and a break from our busy hometown. We found a relaxing and zen place where we'll come back for sure as soon as we can.